January 16, 2019, 7:00 p.m.
As the partial government shutdown moves towards the end of its fourth week, the conflict between the Republican President and the Democrats in Congress is not one President Trump is winning. In the latest Economist/YouGov Poll, the President gets most of the blame for the shutdown, and for the first time in four months his approval rating has dropped below 40%. 39% approve of how Donald Trump is handling his job, 52% do not. The President has been unable to convince most Americans that the wall is the best way to protect the country, or that a crisis on the border requires that he declare a national emergency in order to build a wall. Only one in three believe that a wall is the only way to secure the border, while twice as many Republicans agree. 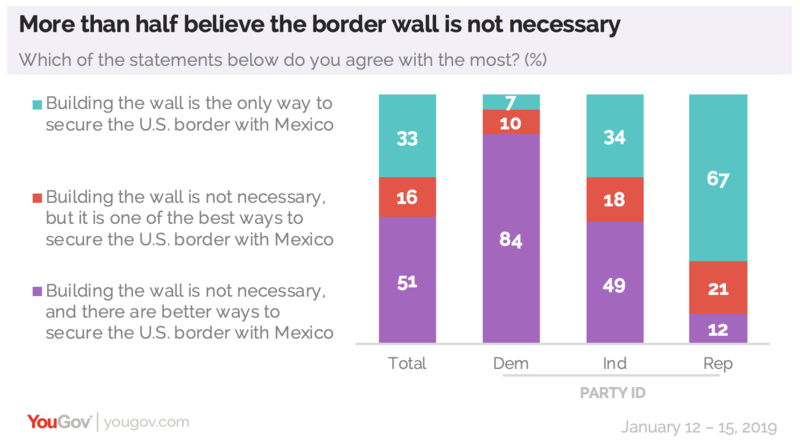 12% of Republicans think that there are better ways of protecting the border than building a wall, agreeing with the half of independents and 84% of Democrats who say this. While 16% overall believe the wall could be a good way to protect the US, they also say it is not necessary. 39% favor building a wall in principle, but 49% oppose it. Opposition has grown in the last few weeks. At the start of the shutdown, as many favored the wall as opposed it. As for the President’s promise of who would pay for the wall – by eleven to one, Americans say the President promised Mexico would do that. As many say that means he promised Mexico would send a check to the US at some point as say he promised to use the trade agreement to cover costs, which is how the President now says Mexico will pay. A majority parts company with the President when it comes to declaring a national emergency to pay for the wall. The public opposes doing this by nearly two to one, though Republicans support such a plan. 45% agree that there is a crisis on the border, while 37% disagree. The question did not separate out those who see a security crisis from those who see a humanitarian one (nearly one in four Democrats, for example, agree there is a crisis). Americans throughout the country are paying a price for what’s now the longest government shutdown. Half or more in every region but the Midwest are personally affected or know someone who is. Nationally, one in five are personally affected, and nearly half know someone else who is. Democrats are far more likely than Republicans to have contact with someone who has been affected by the shutdown. It’s worth noting that Americans – generally – are sympathetic towards those affected. But many are not at all sure the President is. 50% say they care ”a great deal” about those affected, That rises to 58% among those who know someone. Republicans, even those who know someone who has been affected by the shutdown in some way, are less sympathetic. Just a third of them have a great deal of sympathy. 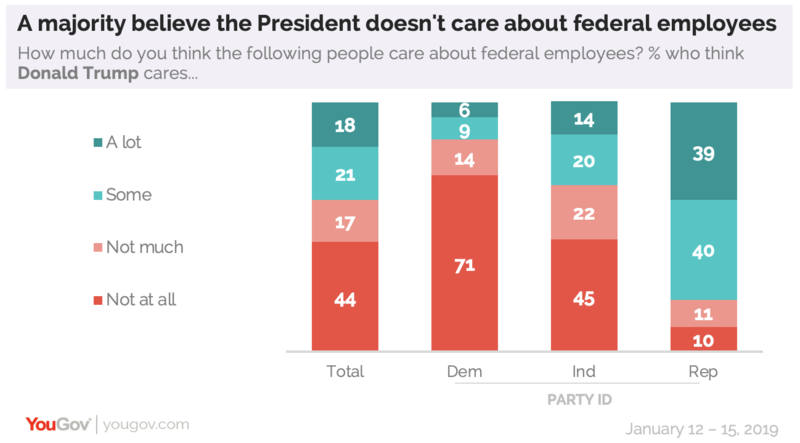 Fewer than one in five say the President cares “a lot” about federal employees. More than twice as many believe he cares “not at all.” 57% give him “a lot” of the blame for the shutdown. Half blame him the most, while a think thinks it’s mostly the Democrats fault. 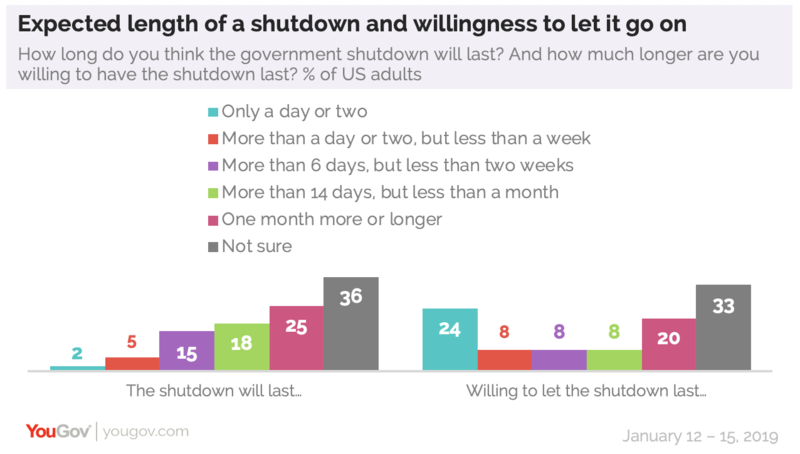 Americans want the shutdown to end soon, but aren’t at all sure it will. Only one in five (and a third of Republicans) are willing to have it go on another month or so. But many fear it will, though 36% admit they have no idea how long the shutdown will last. And as for any resolution, there is a preference for compromise. By more than two to one, Americans believe that’s how all budget debates should end. Only 31% disagree. Republicans also favor compromise in principle 65% to 35%. The President maintains some advantages in the border wall fight. Those who favor his wall support it even if no money comes from Mexico and the U.S. ends up paying for it all. 82% of those who support a wall say it is the only way to secure the border with Mexico. 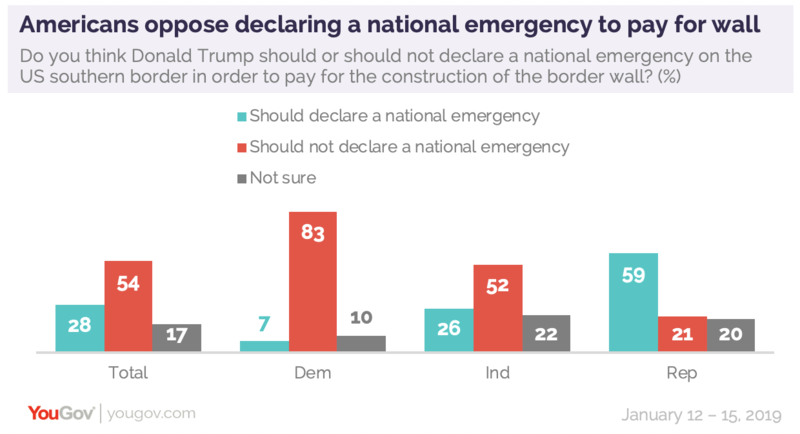 86% of the same group say the border situation is a crisis, 64% would support a national emergency declaration. More importantly, perhaps, this group is more willing to keep the shutdown going. 40% would let it last an additional month or more. That’s something just 7% of wall opponents would favor.